Using an elegant mixture of geometry, graph theory and linear analysis, this monograph completely solves a problem lying at the interface of Isogeometric Analysis (IgA) and Finite Element Methods (FEM). The recent explosion of IgA, strongly tying Computer Aided Geometry Design to Analysis, does not easily apply to the rich variety of complex shapes that engineers have to design and analyse. 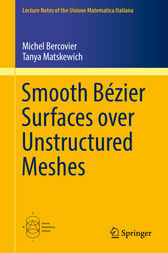 Therefore new developments have studied the extension of IgA to unstructured unions of meshes, similar to those one can find in FEM. The following problem arises: given an unstructured planar quadrilateral mesh, construct a C1-surface, by piecewise Bézier or B-Spline patches defined over this mesh. This problem is solved for C1-surfaces defined over plane bilinear Bézier patches, the corresponding results for B-Splines then being simple consequences. The method can be extended to higher-order quadrilaterals and even to three dimensions, and the most recent developments in this direction are also mentioned here.